We are based in Adelaide and South Australia and have years of experience in the industry. With the most innovative technologies, we promise to deliver just the concrete work that you have quoted for and can completely rely on us for the perfect finish. We tailor our packages according to our customers need. Keeping the environment in mind, we clean the site after work and leave you with a beautiful finish. Our team is always focused on accuracy, reliability, promptness, quality, and reasonable pricing and working accordingly. 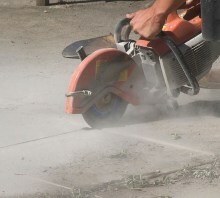 Call us now for your concrete cutting work and get free quotes against your booking. Earth Diggers can do all concrete cutting, including the cutting up and removal of concrete driveways, paths, old shed floor slabs. We are also able to level the ground for you once the concrete is removed.